This four-year programme allows students to follow any of the MSci programmes offered by UCL Earth Sciences, with the additional opportunity to spend year three studying at an approved university in Australia, New Zealand, continental Europe or North America. A score of 17 points in three higher level subjects to preferably include two sciences, with no score lower than 5. A score of 15 points in three higher level subjects to preferably include two sciences, with no score lower than 5. You will have the opportunity to specialise in Environmental Geoscience, Geology, Geophysics, Palaeobiology or Environment and Policy and broaden your horizons by spending the third year of study abroad. Degrees for those specialising in Environmental Geoscience, Geology and Geoscience are fully accredited by the Geological Society of London. The programme includes approximately three months of field classes in the UK and continental Europe, with financial support from the department. World-leading research in geophysical hazards, mineral, ice and rock physics and palaeoenvironmental analysis is undertaken in the department and is used in the development of our modules. You will initially follow the first two years of one of the degree programmes on offer in UCL Earth Sciences (Environmental Geoscience, Geology, Geophysics, or the General, Palaeobiology or Environment and Policy pathways in the Earth Sciences programme) but with an additional option of a foreign language elective. Your third year is spent abroad at an approved university in Australia, New Zealand, continental Europe or North America, and you will return to UCL for your final year. The final title of the degree awarded may reflect the particular choice of modules that you have taken, for example Earth Sciences (International Programme) (Geology) MSci. The number of places available for direct entry onto the International programme is limited and, therefore, competitive. Eligibility to continue will be assessed in both the first and second years of study. Students failing to maintain the required standard will be transferred to the corresponding UK-based MSci or BSc programme. You will select 15 credits of optional modules from Geology, Geophysics and Environmental Geoscience programmes, and the Palaeobiology or Environment and Policy pathways. Year abroad at an approved university in Australia, New Zealand, Japan, continental Europe or North America. 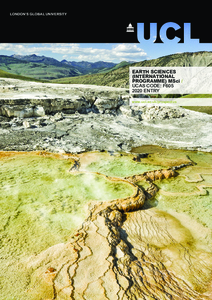 Because the Earth Sciences (International Programme) MSci spans several degree programmes, the modules shown here are illustrative only, using the General pathway in the Earth Sciences MSci as an example. We use a mixture of lectures, practical classes, field courses, directed reading, problem-orientated learning, private study and tutorials to enable you to gain the theoretical knowledge and practical skills demanded by the programme, as well as to develop key transferable skills such as critical analysis, report writing, team working and organisational skills. You will be assessed by a combination of written examinations, practical examinations, coursework, independent project reports and sometimes an oral examination. Detailed course descriptions are available on the department website: Earth Sciences (International Programme) MSci. You will develop both discipline-based and highly sought after analytical skills, together with practical skills such as planning, conducting and reporting on investigations, collecting, recording and analysing data and the ability to undertake field and laboratory research. All our students are encouraged and helped towards making informed career choices. We have excellent relationships with many employers in diverse aspects of the Earth and planetary sciences, and students are actively guided towards achieving their potential at UCL in preparation for their future careers. In addition to further study, main employment destinations include: exploration and production for mining, oil and engineering companies; groundwater resources management; investigating ground conditions associated with land use, such as planning, construction and waste disposal; geological surveying, and collecting geological information for maps and databases. We will assess your application on the basis of your performance, or predicted performance academically, but we will also be looking for an indication of how your interest in natural and Earth sciences has developed, what aspects particularly appeal to you, and whether you have undertaken any research or reading to find out about the subject matter you wish to study. We normally reach a decision on making an offer on the basis of the application alone. If you are resident in the UK and have been made an offer you will be invited to an applicant open day. This visit will include introductory talks on Earth sciences and our degree programmes, a tour of the department and UCL and a question and answer session. Although we do recommend that all applicants who receive an offer visit UCL, we recognise that this is not always possible; applicants from regions distant from London and from outside the UK are not normally required to attend.